Career Development is not just an important part of Personal Finance classes – it is an essential part of what students need to know when they graduate. With this in mind, HTMW is proud to announce our new Career Center, crammed full of awesome resources for teachers, students, and all points in between! There are three main components of the HTMW Career Center: our free Career Development Lessons, our Job/Internship Database, and our Certifications Center. Our new Job and Internship Database pulls in hundreds of thousands of REAL job postings from around the country (and around the world). 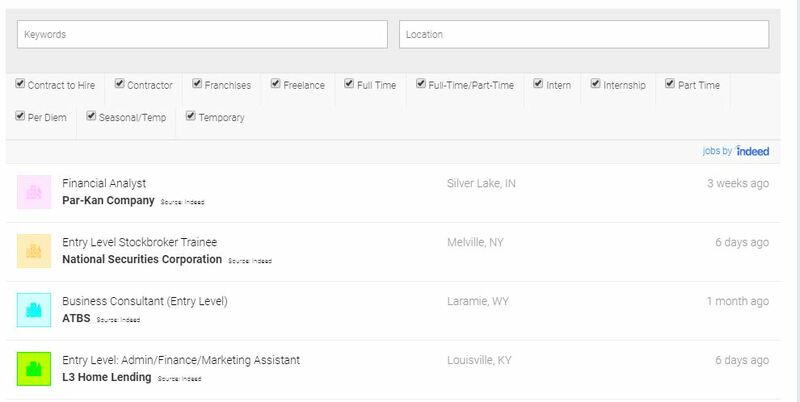 Students can use this new tool to find real job and internship postings that are suited for their career path. While some students may be interested in applying for internships right away, the real strength of the search tool is for career planning – finding postings for what would be each students’ “Dream Job”, and working backwards from the requirements to where they are today. If you have students who aspire to work in the finance industry, our new Certifications Center is the first place to start. This has information about the most important certifications for Accounting, Investing, and Portfolio Management. For college students, we also work with Wiley Publishing to offer big discounts on Certification Exam Prep Courses to help boost their chances of passing on the first try! If you have any questions about our Career Center, be sure to reach out! Happy Trading!